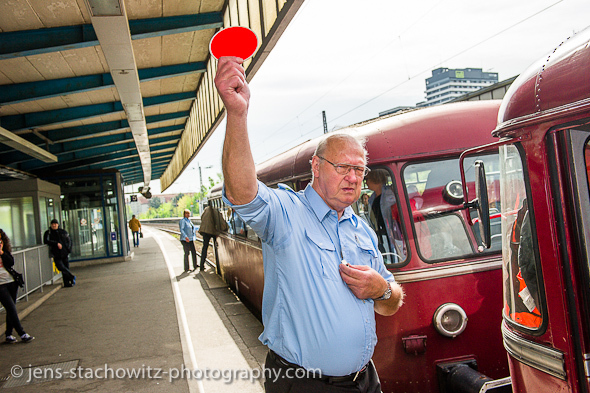 “To go on a cruise with an ancient railbus“ was the childhood dream of Stefan Tigges. He incorporated the Ruhrtalbahn in 2004 and extends his offerings from year to year. At the last weekend in April 2012 he launched his Schienenkreuzfahrt (cruise) trough the Ruhr Area. I had the opportunity to join this event and enjoyed it! Because of the not so much convenient ancient railbus it was a little adventure. I experienced how it felt and looked like to travel in the sixties of the twentieth century and thought back to my own childhood. But I felt no nostalgia, I sensed how convenient we use to travel nowadays. During the cruise we passed a lot of places that are milestones in the history of this region, letting us know and imagine what developments we have begotten or undergone. Due to a very well-informed guide there were a lot of bits of new information I could gather although I live in this region for half a century. I recommend joining the tour.